Have you ever done camping beside a beautiful mountain lake? I did and the experience became a highlight of a very challenging mountain climb made worthy of those little time spent dreamily gazing at the lake and the landscape surrounding it. 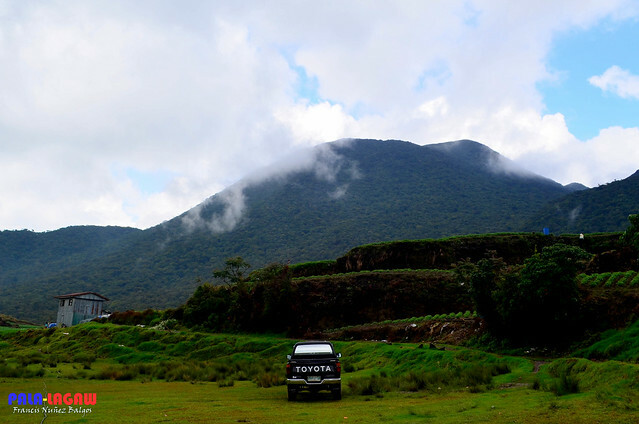 I’ve only done it once, in Lake Venado along the slopes of Mt Apo. It’s not like I’ve never been to any other lakes, I’ve seen Lake Pandin up close, one of those mystical lakes as one of the Seven Lakes of San Pablo Laguna, but mountain lakes are special and that they are a natural wonder to behold. 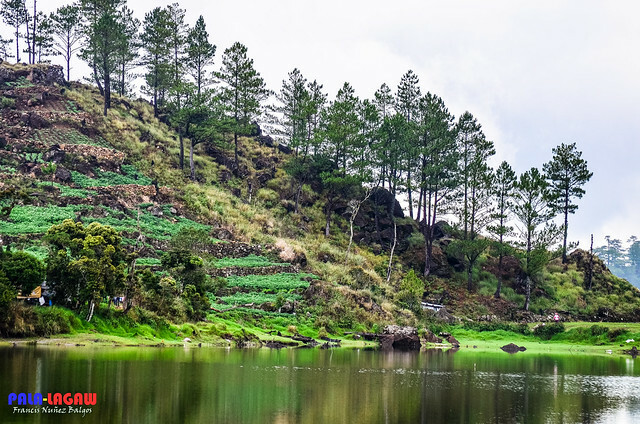 As of this writing, I've seen three mountain lakes or body of water at a high elevation; the first is Lake Venado of Mt Apo, second is this Lake Tabeo of Kabayan Benguet and the last is the Margaha Crater in Mt Kanlaon. I mean to write a separate feature for each because I find them to be a special treat during hiking trips, they serve as a highlight to an arduous and memorable climbs where a tumultuous mind can find a momentary peace. Water is therapeutic; that we all know, so finding bodies of water in places that have outstanding natural landscape view is a gift not to be missed. It was a long drive with many transport transfers. We proved to be road hardy as we arrive in Lake Tabeo for a lunch rendezvous beside this serene lake. Who wouldn’t? 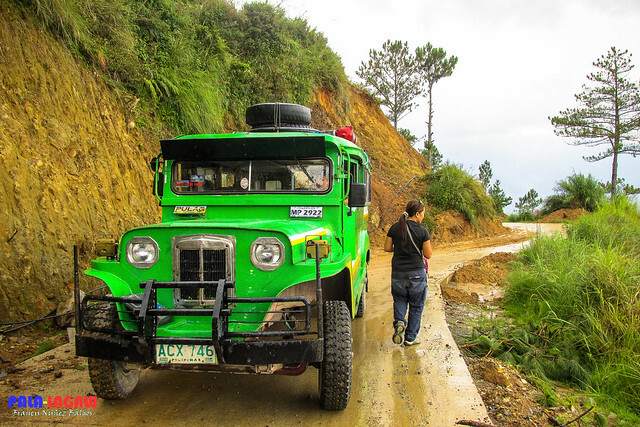 Six hours bus drive from Manila to Baguio is tiresome enough, we took a chartered jeep to bring us to Brgy Tawangan in Kabayan Benguet for a measly 7-8 hours of traveling passing through far flung rural places. 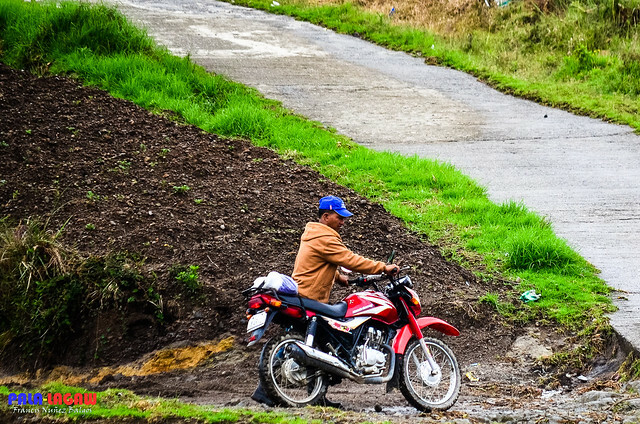 The mountain roads of Cordillera though paved are tricky and dangerous because of steep cliffs and falling rocks from eroding mountains. Just halfway along the ride and we were feeling battered that by this time we had long given up the joy of riding atop the jeep (Toploading). We arrive in the location of Lake Tabeo way past 2 pm after 6 hours of bumpy ride. Our hunger for lunch has already left us but we decided to eat our packed lunch anyway. At first glance I understood why our hike leader Mye made it a point that we stop over at this site. We could’ve eaten our lunch at restaurants along the Highways, but she asked us to buy packed lunch as we will eat along the way. I trust her judgment in things especially if it involves travel itineraries all I asked is for her to bring me there and she can whisk me away with my cameras and hiking bags. How to describe the scene in front of me? 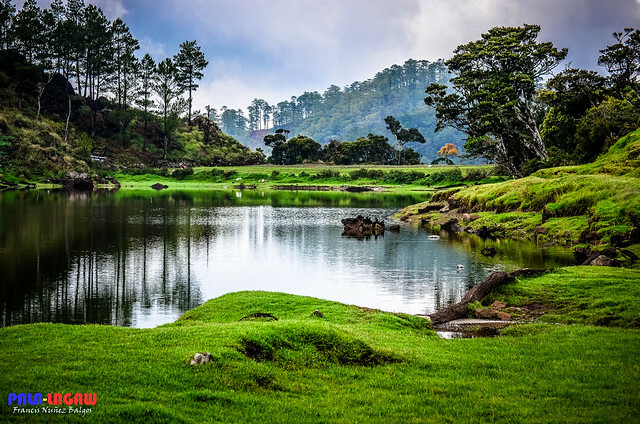 The lake is more like a big fish pond surrounded by a scattering of Pine Trees, farm lands, a few barns and village houses; you can imagine stray dogs coming and sniffing, kids playing around in their sweat shirts and local men driving back and forth in their big motor bikes. Motor bikes are a thing here. There's a farm truck in the corner, the two lane road where our chartered jeep is parked and the looming silhouette of Mt Tabayoc with its thickly dense forest cover. 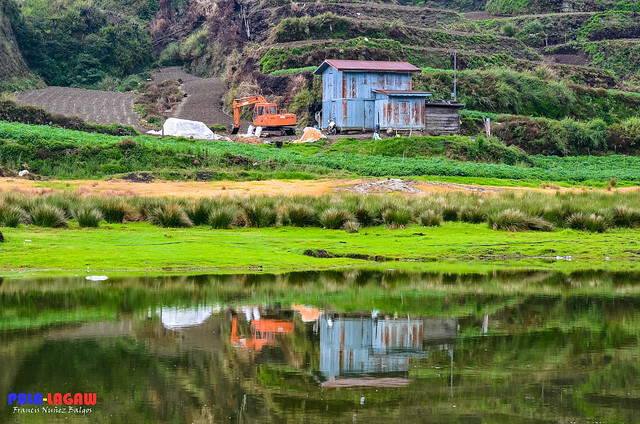 From where we stand, Mt Tabayoc looks mystical with a few clouds kissing its steep slopes and it somehow claims lordship over this little corner of Benguet. Then there is that occasional rain shower making us shiver from the cold weather of the Cordillera's. Its really just another lake or body of water by the road but when you dig deeper in, you can feel serenity that you'd think the waters have been blessed. We were just passing by, but Lake Tabeo left a vivid image in my mind. 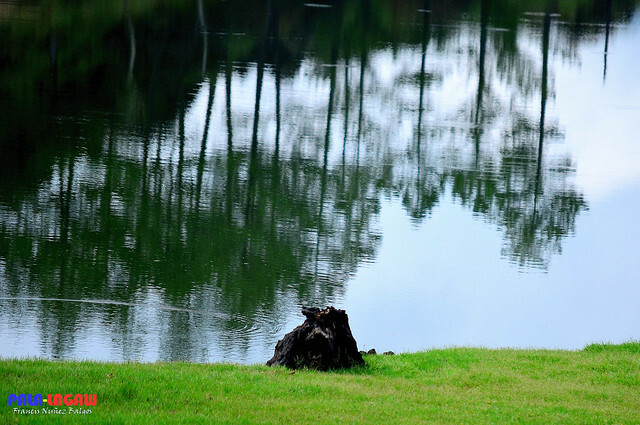 I grew up from province with many fish ponds but never with a serene calmness that this lake brought to me. Perhaps I was tired from the long journey, stressed from work and my wary of my urban life that I easily gave in to the charm before me. As I sat in the concrete barrier facing the lake, scooping the cold rice in my spoon and taking a bite from the cold fried chicken I bought earlier, I found myself feeling calmer and little less worried of my liabilities back in the city. I cant wait to finish devouring my bland meal so I take pictures and just start exploring around before we ride the jeep again for our final stop in Brgy Tawangan. 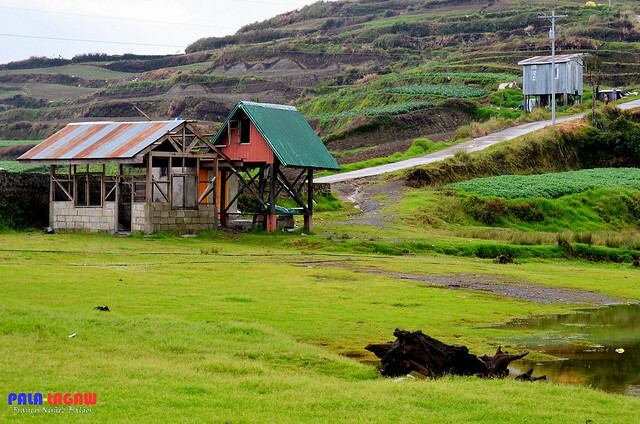 NOTE: This side trip is part of my hiking adventure in Mt Pulag via Tawangan-Akiki trail. Lake Tabeo is a famed campsite and jump off point for hikers climbing Mt Tabayoc. It's also along the way when going to Brgy Tawangan which is a jump to Tawangan Trail of Mt Pulag. The road trip was long and arduous added with cold Cordillera weather and occasional rain. We were also met with many road blocks and construction like this. 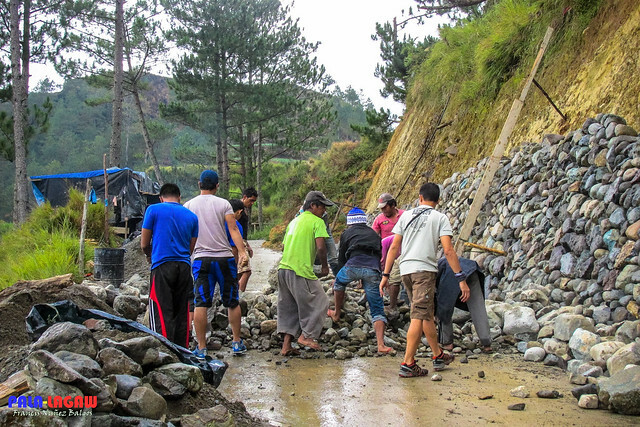 My hike buddies came to aid these men in clearing the stones from blocking the road. Near the lake is this abandoned construction, the skeleton of an unfinished house. Mt Tabayoc, casting a long shadow with its steep slopes and thick forest cover. 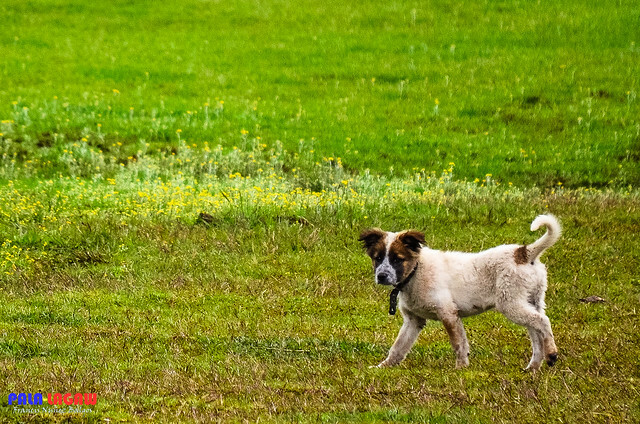 Friendly wandering dogs are everywhere. Ibaloi Men and their Big Bikes. 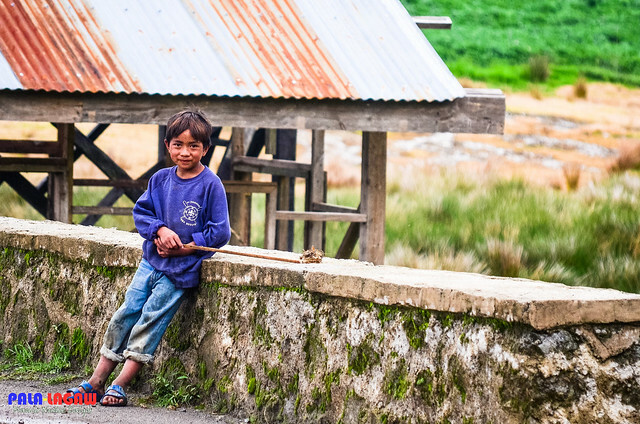 This kid kept a safe distance from us but he seems eager to show what is there at the end of the stick. I wasn't that curios though so I took his photo instead. Smile kiddo! nakakamanagha ang ganda at pagkapayapa ng lugar. It's something that most people in the busy city would like to stay even just for a few days. Great pictures btw. Paved roads na ba going there or may rough road padin?